Despite a number of football clubs being linked with members of his Birmingham City squad, Chris Hughton insists that he is not concerned about the approaching transfer window. The window re-opens on January 1st and many Blues fans are bracing themselves for an auction of the clubs more valuable assets . Rumours are already circulating regarding Jean Beausejour (Wigan Athletic), Nathan Redmond (Manchester City) and Jack Butland (Liverpool & Chelsea). Whilst, Newcastle United have reportedly shown an interest in Liam Ridgewell, who handed in a transfer request on the final day of the summer transfer window. Birmingham City’s fragile financial state will dictate who moves on and for how much, but Hughton will require sufficient backing from the board if Blues are to maintain a credible challenge for the Championship play offs. “No, I’m not thinking at the moment about players I might lose,” Hughton told local media. “I have got a competitive squad and until I’m told anything different, then we work the same way we’ve always worked. “If that’s not the case, then we work the best ways around it and with the best solutions we have. It is very likely that Hughton will lose a number of his first team players and may have to replace them with loan signings as funds are likely to be restricted. “It’s a work in progress,” he said, in reference to potential signings. “We are very much aware of what the financial situation of the club is. “Certainly in this division, the loan market is probably the bigger market. I don’t see too many players coming in for fees, and big fees, in this division. In response to speculation that he is being kept in the dark by the Birmingham board, Hughton said: “I’m in very good communications with Peter Pannu on most days, or most second days. “And no, I am certainly not being kept in the dark. “I have got a very good relationship with Peter. He has kept me very much informed on all the circumstances, where we are. 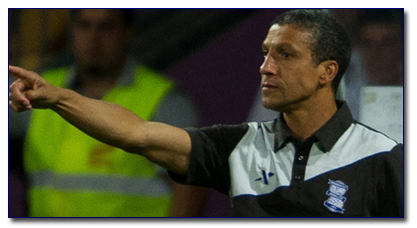 “We can only work with the circumstances as they are,” Hughton continued. “At the moment we have a fit group of players who are still very much Birmingham City players. This entry was posted in BCFC News and tagged bcfc, birmingham city football club, championship football, chris hughton, jack butland, jean beausejour, liam ridgewell, nathan redmond. Bookmark the permalink. CH maybe right when he says all the players linked with moves will still be at the club come the end of January. Firstly, even though the board are desperate to offload Zigic from the wage bill, he is saying that he wont be forced out and is happy to stay at Birmingham. Beausejour has also made it clear he wants to stay at the club and will turn down a move to Wigan. Ridgewell, cheerio son. The worry are the clubs courting the future of Birmingham, Butland, Mutch and in particular, Redmond. If, and its an if, Manchester City do offer £6million for Redmond, do Blues accept it? Bearing in mind the dire financial situation. For me, Blues should put around £25million on each of those youngsters heads. Noone will pay that and therfore they stay put. The worry for me is that Everton had to let their prize youngster, Rooney, leave for United.